Hi, it's Amanda again from sunny Sydney. Spring has arrived and we are in the low 20 degrees at the moment. Well alot has been happening in the JPF, Sydney office since I wrote last time! Events galour! I'm going to tell you about ANIMANIA. 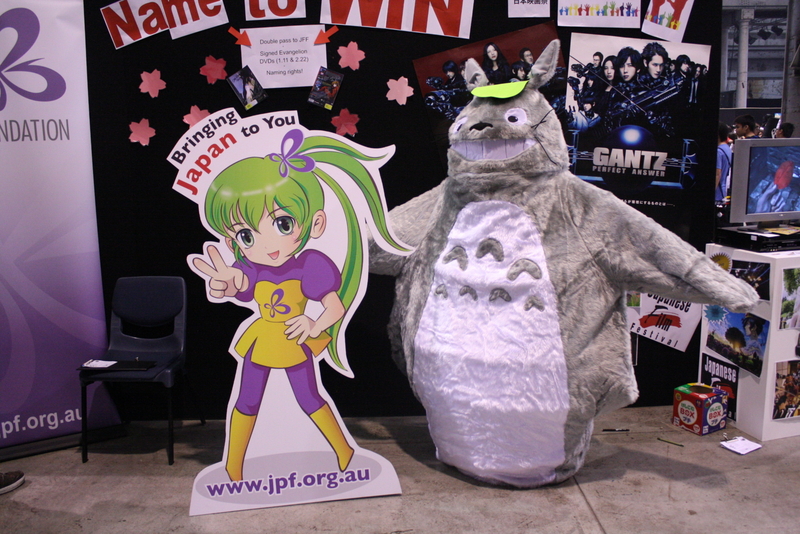 ANIMANIA is a anime convention held in Sydney twice a year. This was my second time to attend and boy was I blown away by some of the elaborate costumes. The cosplayers just love to get dressed up and take photos of one another. As it goes over 2 days, most people have TWO costumes, one for each day. I met, the crew from 'One Piece', Totoro, Rei, ninjas, samurais and many more....the wonderful world of cosplay. There were great food stalls selling Takoyaki,Yakisoba, Toriyaki Ramune, Pokki, tea, the list goes on. The organisers did really well to give that 'Japan' feel to the place. Not only were their stalls to purchase your favourite anime bits and pieces but gaming stations, art competitions, break dancing corner and karaoke! Our booth was right next to the karaoke so we were entertained all weekend by fans blasting out film theme songs! Winners from this convention will go to Nagoya for the World Cosplay Championships. We had an exhibitors stall there, promoting the Japan Foundation, what we do, who we are and getting anime fans also interested in us. Everyone got their photo taken with her and then we also posted the photos of the day on our facebook page. Susie and Evon will fill you in on more events in their blogs to come...stay tuned! !